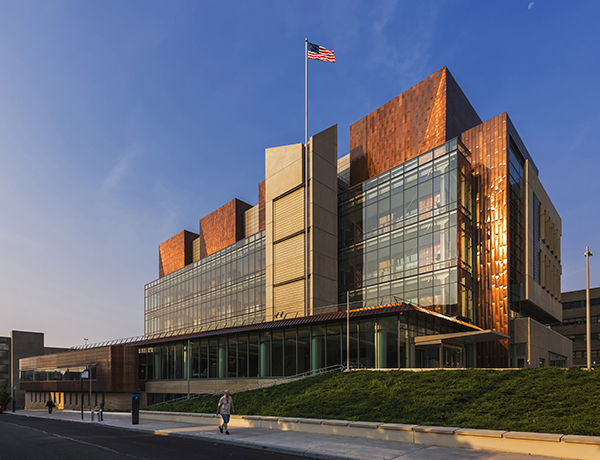 Yesterday’s Archtober group was treated to an in-depth exploration of the new Staten Island Courthouse in St. George, with a number of tour guides led by Susan Rodriguez, FAIA, Partner at Ennead Architects, and Chris Halloran, AIA, LEED AP, Senior Associate at Ennead Architects. We were lucky enough to also have representatives from court planning consultants RicciGreene Associates and structural engineers LERA to share their insights, as well as a number of court employees who showed us around and provided fascinating takes on the building’s use. The project was intended to unify the New York State Supreme Civil and Criminal Courts for Staten Island, as well as the lower Criminal Courts and offices for various other agencies, such as the Richmond County District Attorney and the NYPD. It is, accordingly, an extremely complex program, especially given the security requirements of a criminal courthouse. With defendants, attorneys, witnesses, members of the jury, judges, family members, reporters, and the general public needing to access the courtroom, each one of these groups has to have a clearly choreographed path through the space of the courthouse. Programmatic complexity is only one aspect of the Courthouse’s design. The site’s urban context forces it to be a major player in city-making. To the east, the courthouse faces toward the St. George waterfront, where it is visible from the Staten Island Ferry. It is also situated to the north of Memorial Green, the former site of a quarantine station for immigrants, designed by Mathews Nielsen Landscape Architects; across the green are Borough Hall, the New York Public Library, and the Staten Island Theater. To the west is a residential neighborhood. The south of the courthouse faces a parking garage, built as part of the project, since the courthouse site used to be a municipal parking lot. Moreover, the site dictated long east and west façades and short north and south ends. On the outside, then, the building had to be a transitional zone from arrival to community, from civic to private. The design, accordingly, pushes the public spaces toward the east and the more restricted ones to the west, with courtrooms making up the core. Our tour started on the fifth floor, which houses the judges’ chambers. There, we took in the view from the judges’ lobby to Manhattan on the northeast and out the Verrazano Narrows on the southeast. The second, third and fourth floors are very similar in plan, housing courtrooms, hearing rooms, holding cells for prisoners on the criminal end, robing rooms, and jury deliberation rooms. In the courtrooms, the designers described the complicated process of designing such an important space. Once the preliminary design was made, a full-scale mockup was built, and every judge sat behind the bench to make sure that they could see the faces of witnesses, defendants, and attorneys. This led to adjustments in the lighting so that eye contact could be established. At the same time, while the judge must be able to see everyone, the design needed to ensure the privacy of the documents available to judges and attorneys. The ground floor, which houses the jury assembly room and other receiving functions, extends beyond the rest of the building. Our tour guides led us to the ground floor’s green roof, from where we could admire the façade rising above us; a remarkably smooth glass façade on floors two through four and four copper towers – the building’s visual signature – which house the fifth floor and mechanical services. At the end of the tour, we viewed the jury assembly room – eerily large when empty, but filled every day with 200 potential jurors – and, on the lower level, the arraignment courtroom. The courtrooms have a subtle blue and orange color scheme, echoing the colors of New York State and the Staten Island Ferry’s graphic identity. By the end of the tour, we had come to appreciate the subtle interweaving of spaces that allows for the success of this complex building. Join us tomorrow at the Lenfest Center for the Arts!